One of the best methods for children to acquire knowledge / information is when they experience it on their own. Yet such live experiences are not possible every time. The next best option is to gather the information from a person who has undergone a personal experience.... The month of June had the Billabongers take a trip to NASA/ Kennedy Space Centre. 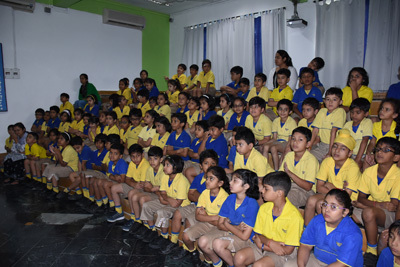 Hence our senior faculty, Ms.Shagun, who was incidentally the tour in-charge, was invited to share her experience of the visit, with the children of Grade 2. Regardless of age, the word 'Space' always arouses one's curiosity to the peak. As the interesting nuggets of information spilled through the PPT and video presentation, questions flew thick and fast: "Why is the launch pad near the ocean or any large water-body? Can we live in space and how? 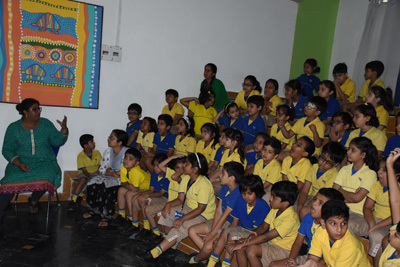 The excitement was palpable to be felt throughout the session. 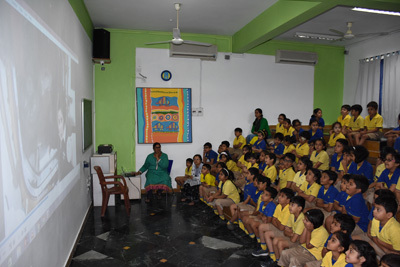 A video watch on Sunita William's stay in Space Station was the icing on the cake.